Data breaches have become a fact of life for organizations of all sizes, in every industry and in many parts of the globe. While many organizations anticipate that at some point a non-malicious or malicious data breach will occur, the focus of this study is to understand the steps organizations are taking—or not taking--to deal with the aftermath of a breach or what we call the Post Breach Boom. 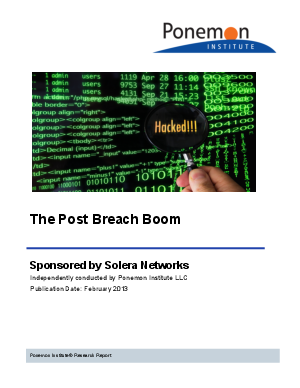 Sponsored by Solera Networks, The Post Breach Boom study was conducted by Ponemon Institute to understand the differences between non-malicious and malicious data breaches and what lessons are to be learned from the investigation and forensic activities organizations conduct following the loss or theft of sensitive and confidential information. The majority of respondents in this study believe it is critical that a thorough post-breach analysis and forensic investigation be conducted following either a non-malicious or malicious security breach.